Simple Mediterranean flavours are front and centre of this glorious roast chicken legs recipe. These are served on a bed of polenta with capers and tomatoes. Roast Chicken Legs with Polenta, Tomato and Capers. 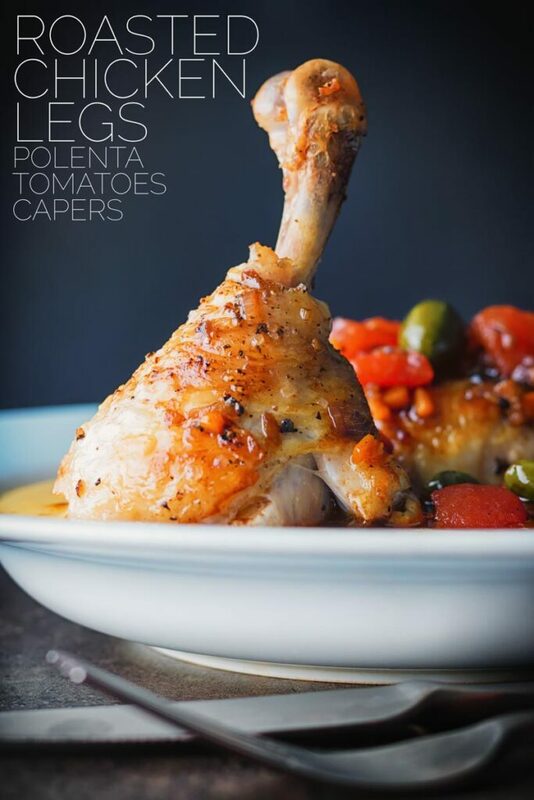 These wonderfully simple Roast Chicken Legs are served with tomatoes, capers and polenta. Capers are a fantastic ingredient that I always have to hand, whether it be for dishes like this Veal Scallopini or these ricotta cheese gnocchi. This recipe is all about great flavour combinations. They are put together in a simple way to make a really tasty and simple dish. Yes you have to stand and stir the polenta but lets face it any chimp can stir. And as far as I am concerned a perfectly roasted chicken leg is about as tasty as it gets. ‘Brown’ chicken meat has so much more flavour than the ‘white’ meat and let’s face it food is all about flavour! All of the ingredients for this recipe are as cheap as chips and it is easily scaled up or down as you wish. How to Roast Chicken Legs. I’m about to break out a tip here, please note it is a tip, not a hack… Because there is no such thing as a ‘kitchen hack’ no matter what Facebook likes to tell you! Anyway, buy a meat thermometer, seriously just buy one. Because you will get perfectly cooked meat every single solitary time! 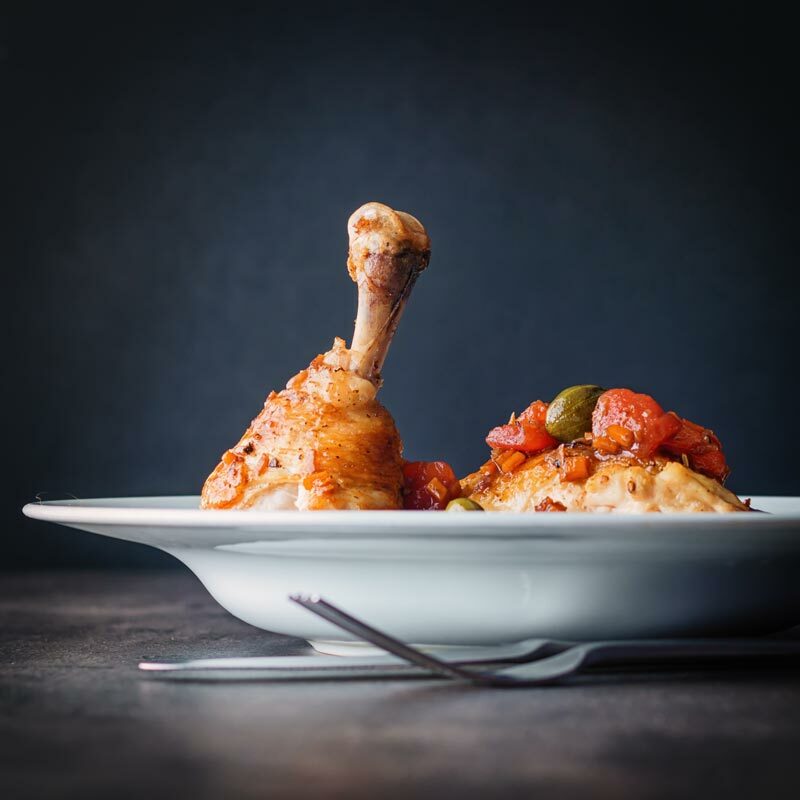 Roast chicken legs can and will take anywhere between 25 and 40 minutes depending on a host of variables. Everything from the accuracy of your oven through to the size of the leg and the way it is cut to where you put the chicken in the oven will all play its part. However, if you remove your chicken leg from the oven when the internal temperature of the meat is at 70°C. Then rest it until it reaches 73°C (that’s 158 °F and 164°F) it will be juicy, perfectly cooked and safe to eat every single time. How to Prepare Chicken Legs. I typically buy whole chickens and joint them because It is a fabulously frugal way of shopping! I have a video for you that shows you the techniques I use, including removing the knuckle. The chicken leg section begins at around 11 seconds if you want to scrub through. I’ll take off the legs and do something like this roasted chicken leg or even these Za’atar chicken legs. Then either take off the wings and freeze them until I have enough to do some hot wings. Then I’ll take the breasts and then maybe stuff them or make roast them off and serve with petis pois a la Francaise, and even then I ain’t finished. I will take the carcass roast it off, turn it into stock and make ramen. Seriously 1 chicken, will make at least 3 meals for 2 and that is without trying, I could easily stretch that to 5! 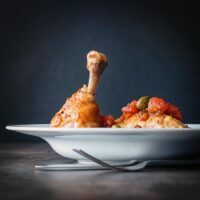 Simple Mediterranean flavours are front and centre of this glorious roast chicken legs recipe which is served over a bed of polenta. Bring some water to the boil, cut a cross in the base of the tomatoes and plunge them in for 30 seconds. Refresh on cold water and you should now be able to peel the tomatoes and remove the seeds, cutting into 1cm cubes. This should leave around 175-225g of tomato cubes. Heat a pan over a medium heat and when hot add the olive oil. Season the chicken with salt and pepper and brown in the oil. Remove the chicken and now add the shallot, celery and carrot cooking for 2-3 minutes to soften. Add the balsamic vinegar and tomatoes and stir. Nestle the chicken among the rest of the ingredients and sprinkle over the capers and transfer to the oven for 40 minutes. Bring the chicken stock to the boil and slowly pour in the polenta and return to an 'almost boil'. Now turn down the heat under the polenta to low and cook stirring every couple of minutes for 40 minutes. Grab a glass of wine and some music you will be fine! Stir in the butter and Parmesan cheese and check the polenta for seasoning before serving. Blitzing down some of the tomatoes and vegetables with the cooking juices makes a glorious sauce if you want one. I like to separate my chicken leg into thigh and drumstick, in the main it is for 'presentation' purposes and is not essential, although it does help with the practicalities of eating too! My stomach literally rumbled. It is Thanksgiving for us Canadians, and I am not a fan of turkey. Chicken is so much better! A turkey is way too much for the two of us so pretty much never cook it, chicken legs on the other hand are p a perfect size for a single serving have a much better flavour profile and is just all around a winner… Hope you had a great Thanksgiving! This would make such a delicious and special dinner for a birthday or anniversary. It’s really rather simple so no need to wait for a special occasion, it’s everyday food for us. I totally agree that a meat thermometer is a must. Cooks who rely on the time range in a recipe, are missing out on fabulously tender but not-over-cooked meat! Absolutely, there are just too many variables to rely on timing and perfectly cooked meat is such a real treat! This sounds like one of those ultimate autumn/winter comfort food recipes. It looks great the way it’s been presented too. 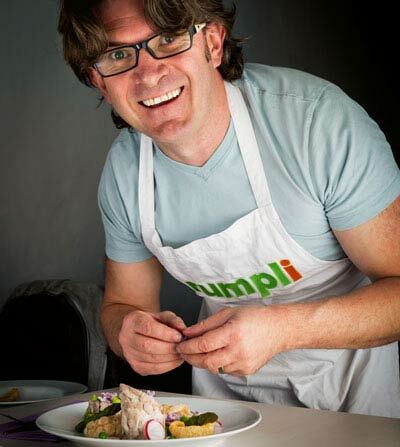 Love your style of cooking, you should definitely have a tv show. Love step 10. Great kitchen tips too. 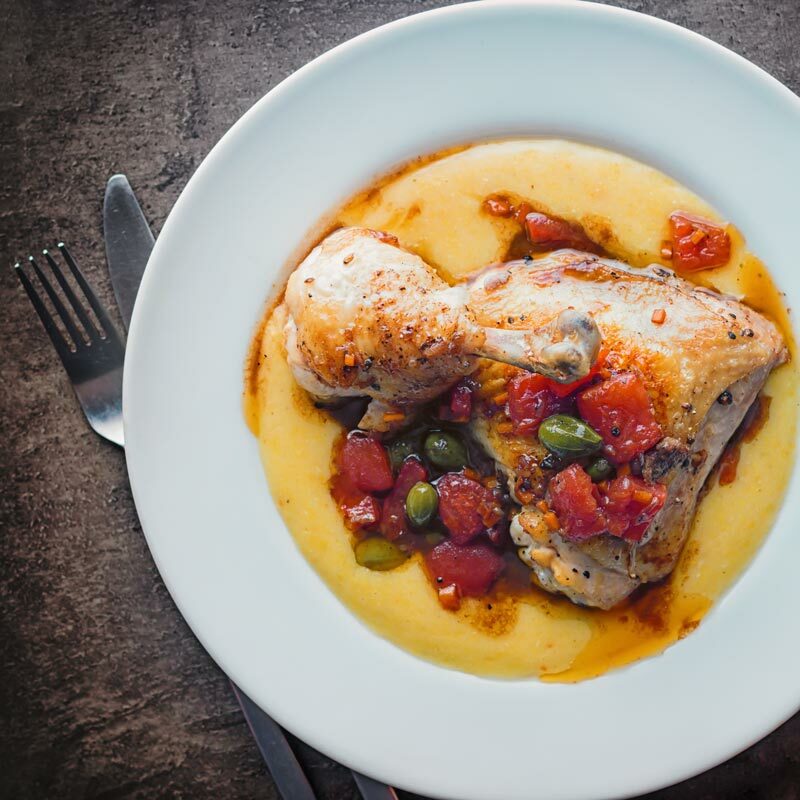 Chicken, polenta and tomato are an absolutely winning combination – This would have been an incredible tasting dish. It certainly was, cheers Amanda.